Location of the study area (outlined) in the Netherlands. Grey = area inside the Roman Empire. The project aims to apply spatial dynamical modelling to reconstruct and understand the development of the cultural landscape in the Dutch part of the limes zone during the Early and Middle Roman period (15 BC – 270 AD). It will focus on modelling economic and spatial relations between the Roman army and the local population, in particular the interaction between agriculture, animal husbandry and wood management, and the related development of settlement patterns and transport networks in the area. The ambition is to develop quantified spatio-temporal palaeo-economic scenarios of agrarian production in a complex context. The study area and period offer two challenges in this respect. Firstly, the Roman Empire developed macro-economic policies concerning taxation and land ownership that strongly influenced the local agrarian economy. Furthermore, the Dutch part of the limes zone is located in the Rhine-Meuse delta, a dynamic fluvial environment in which the Romans developed a sophisticated water management infrastructure. An integral analysis of the socio-economic system in that area therefore has to consider all the local, regional and supra-regional factors involved in economic development. The interaction of environmental, economic and socio-cultural factors must also be examined. The Dutch limes zone is one of the archaeologically best researched areas in the world (Willems 1986; Kooistra 1996; Roymans 2004; Groot et al. 2009; Vos 2009; Heeren 2009). Consequently, a rich set of archaeological and palaeo-environmental data has been collected over the past decades. It is therefore an ideal laboratory area to construct new models of the development of the cultural landscape. Spatial dynamical modelling is a computer technique for building quantitative models that will simulate spatial processes – like the development of land use – over time. A clear distinction can be made between static, analytical modelling, and dynamic, simulation modelling (Borshchev and Filippov 2004). Analytical models are suitable for situations where we can directly apply mathematical equations to the problem at hand, resulting in a single solution. An archaeological example is predictive modelling of site locations based on logistic regression equations (e.g. Warren 1990). Simulation models are appropriate when we are interested in change. A simulation model is essentially a set of rules that define how the modelled system changes over time. Simulation is the process of taking the model through its state changes over time. Agent-based modelling (ABM) is currently the most popular technique for simulation modelling. Agents can be thought of as (groups of) objects or subjects (e.g. individuals, households, army units) that are supplied with specific rules of behaviour. The interaction between the agents determines the next state of the model. Over the past years, ABM software has acquired the capability to work with geographically referenced data, allowing for the modelling of spatial processes over time. Agent-based modelling is based on complex systems theory (see Van der Leeuw and McGlade 1997; Bentley and Maschner 2003), which combines the principles of chaos theory with the concept of interacting agents. According to chaos theory, natural and social processes that can be captured in deterministic models and equations will nevertheless have unpredictable outcomes in the long run. Models departing from almost identical starting points may show very different trajectories through time, depending on the initial conditions and the time that they are allowed to run (see Bentley 2003). Complex systems theory adds an extra element to these models by introducing agents that can interact with each other, and subsequently adapt their behaviour. Complex systems are known as ‘self-organizing’ and exhibit what are known as ‘emergent properties’, which cannot be deduced from the individual components of the system. Modelling based on complex systems theory is especially useful to investigate cause-and-effect chains. It also allows us to study whether developments inevitably lead in a certain direction (path dependence), and if different scenarios will produce similar outcomes (equifinality). Complex systems theory is used for studying dynamical processes in a number of fields, ranging from physics and biology to economics, sociology and linguistics. Agent-based modelling is primarily used for exploring how micro-scale processes give rise to macro-scale phenomena. It is consequently of great interest to archaeology, where we can usually only observe the macro-scale results of micro-scale actions in the past. Several archaeological studies have used ABM for this purpose. Kohler et al. (2000; 2007) have studied the development of pre-Hispanic settlement and agriculture in the Mesa Verde region of New Mexico using ABM. Other groundbreaking studies include those by Lake (2000) on Mesolithic hazelnut gathering strategies and Wilkinson et al. (2007) on the development of settlements in Bronze Age Mesopotamia. These studies show that ABM is a useful technique to experiment with different theoretical approaches to questions concerning subsistence production, demographic development and the transformation of settlement patterns through time, and to develop new perspectives on these issues. When the Romans occupied the Rhine-Meuse delta ca. 15 BC, they started to fortify the Rhine border (the limes) with garrisons. A linear defence system was developed along the south banks of the Rhine, with legions stationed in the castra of Nijmegen (Noviomagus), and further upstream in Germany (Xanten). In between the castra, they built castella that garrisoned auxiliary troops. A road was built on the south bank of the Rhine to accommodate the transport of troops and goods; the river itself was intensively used for shipping. In the area south of the border, local groups and newcomers (Batavians) were encouraged to settle. After 47 AD, this system gradually developed into a tight border defence, and the area south of the border experienced strong economic and demographic growth. In the 3rd century AD, the pressure from invading Germanic tribes became stronger and stronger, until 270 AD when the border collapsed. While the Romans managed to re-establish their presence in the area in the late 3rd century, the linear defence system was not restored, and the population never returned to its previous levels. In order to maintain the garrisons, provisions were needed: the soldiers had to be fed and clothed; they needed firewood, weapons and utensils, transport animals, fodder and building materials (wood, stone and brick). It is assumed that this economic demand could only partially be met within the area (see Willems 1986). Crucial resources like stone and metal are absent from the region; specialized craftsmen were not available everywhere; and certain foodstuffs particular to the Roman diet, like bread wheat, fish sauce and wine, had to be imported. However, it is assumed that the Romans relied on local supplies for a number of resources, like barley, meat, leather, wool, horses, traction animals, firewood and bricks. Horses were probably even exported outside the Dutch limes region, and evidence for specialized production of wool is found (Groot 2008). Obviously, this implies that the local farmers were able to produce surplus crops and livestock (Groot et al. 2009). The development of a regional and supra-regional trade system had a major effect on the settlement system and land use in the area. The Romans adapted the military infrastructure to the constraints and possibilities offered by the river landscape, and modified it in order to facilitate transport and trade by building harbours, canals and roads. The local population profited from these developments, as evidenced by an increase in the number and size of settlements, and the influx of Roman luxury goods. These developments are well known in general terms. A number of studies describe and analyze the Roman defence system, its economic demands and its relation to the local settlement system (e.g. Bloemers 1978; Willems 1986; Kooistra 1996; Cavallo et al. 2008; Kooistra 2009; Vos 2009). However, no attempts have been made to reconstruct and understand the development of the cultural landscape through a model-based approach. How can we use spatial dynamical modelling to better understand the interaction between diverse but related economic activities like agriculture, animal husbandry and wood production? How do we translate the currently prevalent ‘expert judgement’ models regarding these issues into formal simulation models? How can we use palaeo-environmental and archaeological data to create the starting conditions and benchmarks for the models? What modelled socio-economic development scenarios for the limes area are best suited to explain the observed archaeological and palaeo-environmental record? What can the models tell us about the way the Romans organized the production, transport and distribution of goods needed for the military infrastructure? What can the models tell us about economic and social interactions between the Roman army and the local population? What can the models tell us about the interplay of natural and socio-cultural factors in the development of the cultural landscape? the interaction between the natural, economic and socio-cultural factors shaping the landscape. 2. To produce a set of procedures and tools (best practices) on how to use spatial dynamical modelling, and in particular ABM, for this purpose. It is the project’s ambition to connect models of subsistence production at the household level to regional and supra-regional trade models; to link models of agricultural production to models of natural vegetation development; to connect models at different scale levels (micro- and macro-regional); and to find suitable methods to confront the model outcomes with the available archaeological and palaeo-environmental data. The project is built on three axes: landscape reconstruction, palaeo-economic analysis, and spatial dynamical modelling. The modelling will focus on the three most important economic activities that influence land use and settlement: agricultural production, animal husbandry, and wood management. The period considered is the timeframe 15 BC – 270 AD, i.e. from the start of the Roman occupation of the area until the collapse of the Rhine border. The study area roughly comprises the Rhine-Meuse delta. Whitley’s (2005) approach of ‘cognitive predictive modelling’ will be used as the starting point for the modelling. The building blocks are conditions (e.g. the natural landscape in the Rhine border region, the Roman taxation regime), events (occurrences that are outside the control of the agents; e.g. the arrival of Roman troops in the area, the Batavian revolt) and decisions (within control of the agents; e.g. whether to change the agricultural production regime to produce surplus crops). These decisions are arrived at through a cost-benefit evaluation of the conditions. Decisions, once taken, will of course influence the initial conditions. It is this feedback that, together with any external events happening, produces the changes in land use and economy. Simplified modelling procedure (based on Whitley 2005). Costs and benefits are evaluated by the agents on the basis of what can be called their ‘perception’ of the initial conditions. For example, a farmer wanting to grow barley has different ideas about the costs and benefits that the landscape may offer than a cattle breeder. Furthermore, agents may have different cultural backgrounds and knowledge that will influence their decision-making. 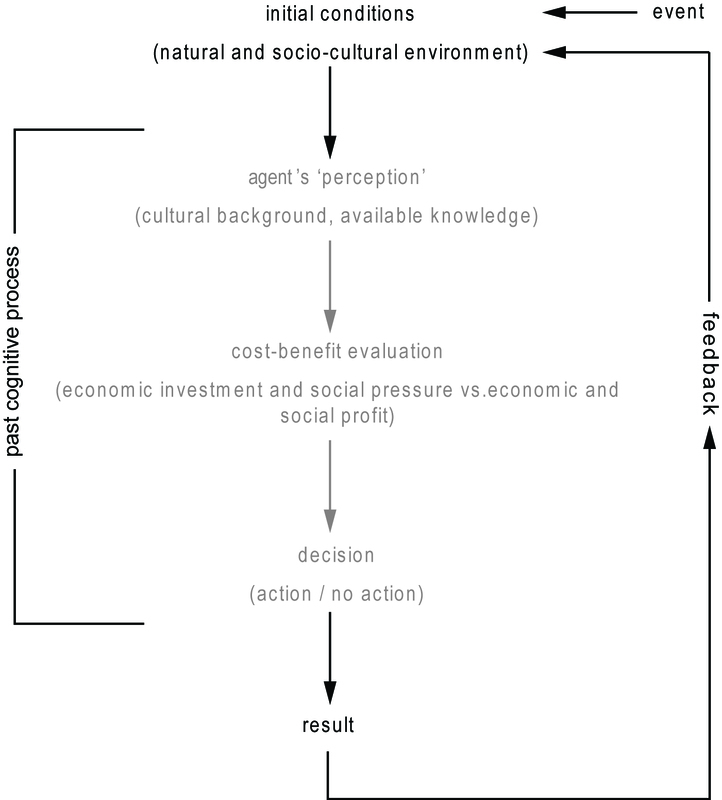 The challenge is to translate and develop archaeological theories into such a framework (Verhagen and Whitley 2011). An important consideration is the way in which the conditions are translated into costs and benefits. Cost surfaces will be employed to specify the costs of moving from one place to another in the landscape, and estimate how much effort it takes to e.g. hunt game, grow crops or catch fish when departing from a specific location (see Van Hove 2003; Whitley et al. 2010). They are also used to calculate least-cost paths, i.e. to find the easiest connection between a set of points, based on the principle of least effort (Bell and Lock 2000; Bell et al. 2002; Howey, 2007; Fiz and Orengo 2008; Howey 2011). However, the use of cost surfaces and least-cost paths is beset with a number of theoretical (Murrieta Flores 2010) and technical problems (Herzog 2010; Polla and Verhagen in prep.). The GIS-based tools currently available need to be supplemented with network analytical techniques to model the development of a travel and transport network, such as was installed by the Romans in the limes area (Zakšek et al. 2008; Verhagen 2010; Verhagen et al. in prep.). The integration of cost surface calculations, network analysis and ABM is still very weak. Therefore, more efficient tools for this will be developed by re-programming and integrating existing software solutions. Agent-based modelling is relatively demanding in terms of computing power. When the number of agents becomes very large, and the time steps between model states are very small, the time needed to run the models can become prohibitive. Computational efficiency will be a priority in setting up the models, and supercomputing facilities will be used when necessary. The opportunities and limitations for individuals to make a living are not influenced solely by the natural environment and economic considerations. The socio-cultural context is an important factor as well, and will be included in the models. Agent-based models are ideal vehicles for this purpose. For example, Altschul et al. (in press), working in a study area in Senegal, used ABM to compare an ‘egalitarian’ model of prehistoric society to a ‘stratified’ model. In the first case, households are allowed to make their own decisions on where to plant crops, what types of crops to grow, and who to sell the surplus to. In the second case, agents are thought of as collectives, consisting of a small number of nobles and a larger number of commoners and serfs. These collectives have differential access to land, depending on their lineage, and wealth is distributed unequally among the members of the collective. These are the types of decision-making ‘perceptions’ that will be modelled in the project. The modelling will result in scenarios of land use development through time, in the form of dynamic maps and graphs. The end results can be compared to observed archaeological settlement distributions (see Kohler et al. 2007), and thus be used to assess the plausibility of the modelled scenarios. The results of ABM should however not be mistaken for predictions (Bentley 2003). The models can offer explanations for the emergence of observed patterns, but will never be replications thereof. Altschul, J.H., R. Ciolek-Torrello, M. Heilen, W. Hayden, J.A. Homburg, G. Wait, and I. Thiaw (in press). Incorporating GIS Methodological Approaches in Heritage Management Projects. In Verhagen, P., A. Posluschny, and B. Danielisová (eds. ), Go your own least cost path. Spatial technology and archaeological interpretation, Archaeopress, Oxford. Bell, T., and G. Lock (2000). Topographic and cultural influences on walking the Ridgeway in later prehistoric times. In Lock, G. (ed.) Beyond the Map. Archaeology and Spatial Technologies, IOS Press/Ohmsha, Amsterdam, pp. 85-100. Bell, T., A. Wilson, and A. Wickham (2002). Tracking the Samnites: Landscape and Communication Routes in the SangroValley, Italy. American Journal of Archaeology 106: 169-186. Bentley, R.A. (2003). An Introduction to Complex Systems. In Bentley, R.A., and H.D.G. Maschner (eds. ), Complex Systems and Archaeology. Empirical and Theoretical Applications, University of Utah Press, Salt Lake City, pp. 9-23. Bentley, R.A., and H.D.G. Maschner (eds.) (2003). Complex Systems and Archaeology. Empirical and Theoretical Applications, University of Utah Press, Salt Lake City. Berendsen, H.J.A., and E. Stouthamer (2001). Palaeogeographic development of the Rhine-Meuse delta, The Netherlands, Van Gorcum, Assen. Bloemers J.H.F. (1978). Rijswijk (Z.H. ), ‘De Bult’. Eine Siedlung der Cananefaten. Rijksdienst voor het Oudheidkundig Bodemonderzoek, Amersfoort (Nederlandse Oudheden 8). Borshchev, A., and A. Filippov (2004). From System Dynamics and Discrete Event to Practical Agent Based Modeling: Reasons, Techniques, Tools. Proceedings of the 22nd International Conference of the System Dynamics Society, 25-29 July, Oxford. Cavallo C., Kooistra, L.I. and Dütting, M.K. (2008). Food supply to the Roman army in the Rhine delta in the first century AD. In: Stallibrass, S. and R.Thomas (eds. ), Feeding the Roman Army, Oxbow Books, Oxford, pp. 69-78. Dinter, M. van (in prep. ): Een landschapsreconstructie van het westelijk deel van de limes, Radboud Universiteit, Nijmegen. Fiz, I., and H. Orengo (2008). Simulating Communication Routes in Mediterranean Alluvial Plains. In Posluschny, A., K. Lambers, and I. Herzog (eds. ), Layers of Perception. Proceedings of the 35th International Conference on Computer Applications and Quantitative Methods in Archaeology (CAA), Berlin, Germany, April 2–6, 2007 Dr. Rudolf Habelt GmbH, Bonn, pp. 316-321. Fyfe, R. (2006). GIS and the application of a model of pollen deposition and dispersal: a new approach to testing landscape hypotheses using the POLLANDCAL models. Journal of Archaeological Science 33: 483-493. Groot, M. (2008). Animals in ritual and economy in a frontier community. Excavations in Tiel-Passewaaij. Vrije Universiteit, Amsterdam (PhD-thesis). Groot, M., Heeren, S., Kooistra, L.I. and Vos, W. (2009). Surplus production in rural settlements in the Dutch River Area in the Roman period: integrating the evidence from settlement archaeology, botanical archaeology and zooarchaeology. Journal of Roman Archaeology 22: 231-252. Heeren, S. (2009). Romanisering van rurale gemeenschappen in de Civitas Batavorum. De casus Tiel-Passewaaij, Vrije Universiteit, Amsterdam (PhD thesis). Herzog, I. (2010). Theory and Practice of Cost Functions. Paper presented at CAA2010, Granada, 2-6 April. Hove, D. Van (2003). Imagining Calabria. A GIS approach to Neolithic landscapes. Unversity of Southampton, Southampton (PhD Thesis). Howey, M.C.L. (2007). Using multi-criteria cost surface analysis to explore past regional landscapes: a case study of ritual activity and social interaction in Michigan, AD 1200-1600. Journal of Archaeological Science 34: 1830-1846. Howey, M.C.L. (2011), “Multiple pathways across past landscapes: circuit theory as a complementary geospatial method to least cost path for modeling past movement”, in: Journal of Archaeological Science, Accepted Manuscript, Available online 26 March 2011. Kohler, T.A., J. Kresl, C. Van West, E. Carr, and R.H. Wilshusen (2000). Be There Then: A Modeling Approach to Settlement Determinants and Spatial Efficiency Among Late Ancestral Pueblo Populations of the MesaVerde Region, U.S. Southwest. In Kohler, T.A., and G.J. Gumerman (eds. ), Dynamics in Human and Primate Societies: Agent-Based Modeling of Social and Spatial ProcessesOxfordUniversity Press, New York, pp. 145-178. Kohler, T.A., C.D. Johnson, M. Varien, S. Ortmann, R. Reynolds, Z. Kobti, J. Cowan, K. Kolm, S. Smith, and L. Yap (2007). Settlement Ecodynamics in the Prehispanic Central Mesa Verde Region. In Kohler, T.A., and S.E. van der Leeuw (eds. ), The Model-Based Archaeology of Socionatural Systems, SAR Press, Santa Fe, pp. 61-104. Kooistra, L.I. (1996). Borderland Farming. Possibilities and limitations of farming in the Roman Period and Early Middle Ages between the Rhine and Meuse, Van Gorcum, Assen. Kooistra, L.I. (2009). The provenance of Cereals for the Roman Army in the Rhine Delta. Based on Archaeobotanical Evidence. Beihefte der Bonner Jahrbücher 58(1): 219-237. Lake, M.W. (2000). MAGICAL Computer Simulation of Mesolithic Foraging. In Kohler, T.A., and G.J. Gumerman (eds. ), Dynamics in Human and Primate Societies: Agent-Based Modeling of Social and Spatial Processes, OxfordUniversity Press, New York, pp. 107-143. Leeuw, S.E. van der, and J. McGlade (eds.) (1997). Time, process and structured transformation in archaeology, Routledge, London. Murrieta Flores, P.A. (2010). Traveling in a Prehistoric Landscape: Exploring the Influences that Shape Human Movement. In Frischer, B., J. Webb Crawford, and D. Koller (eds. ), Making History Interactive. Computer Applications and Quantitative Methods in Archaeology (CAA). Proceedings of the 37th International Conference, Williamsburg, Virginia, United States of America, March 22-26, 2009, Archaeopress, Oxford, pp. 249-267. Polla, S. and P. Verhagen (eds.) (in prep.) Computational Approaches to Movement in Archaeology. De Gruyter, Berlin. Roymans, N. (2004). Ethnic Identity and Imperial Power. The Batavians in the Early Roman Empire, AmsterdamUniversity Press, Amsterdam. Vos, W.K. (2009). Bataafs platteland. Het Romeinse nederzettingslandschap in het Nederlandse Kromme-Rijngebied, Rijksdienst voor het Cultureel Erfgoed, Amersfoort. Vossen, I. (2003). The possibilities and limitations of demographic calculations in the Batavian area. In Grünewald, T. and S. Seibel (eds. ), Kontinuität und Diskontinuität. Germania inferior am Beginn und am Ende der römischen Herrschaft, De Gruyter, Berlin/New York (RGA-Erganzungsband 35), pp. 414-435. Verhagen, P. (2010). On the road to nowhere? Least cost paths, accessibility and the predictive modelling perspective. Paper presented at CAA2010, Granada, 6-9 April. Verhagen, P., S. Polla and I. Frommer (in prep.). Finding Byzantine junctions with Steiner trees. In Polla, S. and P. Verhagen (eds. ), Computational Approaches to Movement in Archaeology. De Gruyter, Berlin. Verhagen, P., and T.G. Whitley (2011). Integrating Archaeological Theory and Predictive Modelling. A Live Report from the Scene. Journal of Archaeological Method and Theory, online first version. Visser, R. (2006). Behoefte aan bouwhout in de Nederrijnse regio tijdens de Romeinse tijd. In Gehring, E., D. Habermehl, R. van ‘t Veer, and I. Venderbos (eds. ), SOJAbundel 2006. Symposium voor Onderzoek door Jonge Archeologen, Stichting Onderzoek Jonge Archeologen, Leiden, pp. 107-114. Warren, R.E. (1990). Predictive modelling in archaeology: a primer. In Allen, K.M.S., S.W. Green, and E.B.W. Zubrow (eds. ), Interpreting space: GIS and archaeology, Taylor & Francis, London, pp. 90-111. Whitley, T.G. (2005). A Brief Outline of Causality-Based Cognitive Archaeological Probabilistic Modeling. In Leusen, M. van, and H. Kamermans (eds. ), Predictive Modelling for Archaeological Heritage Management: a research agenda, Rijksdienst voor het Oudheidkundig Bodemonderzoek, Amersfoort, pp. 123-138. Whitley, T.G., G. Moore, G. Goel, and D. Jackson (2010). Beyond the Marsh: Settlement Choice, Perception and Spatial Decision-Making on the Georgia Coastal Plain. In Frischer, B., J. Webb Crawford, and D. Koller (eds. ), Making History Interactive. Computer Applications and Quantitative Methods in Archaeology (CAA). Proceedings of the 37th International Conference, Williamsburg, Virginia, United States of America, March 22-26, 2009, Oxford, pp. 380-390. Wilkinson, T.J., M. Gibson, J.H. Christiansen, M. Widell, D. Schloen, N. Kouchoukos, C. Woods, J. Sanders, K.-L. Simunich, M. Altaweel, J.A. Ur, C. Hritz, J. Lauinger, T. Paulette, and J. Tenney (2007). Modeling Settlement Systems in a Dynamic Environment. Case Studies from Mesopotamia. In Kohler, T.A., and S.E. van der Leeuw (eds. ), The Model-Based Archaeology of Socionatural Systems, SAR Press, Sante Fe, pp. 175-208. Willems, W.H.J. (1986). Romans and Batavians. 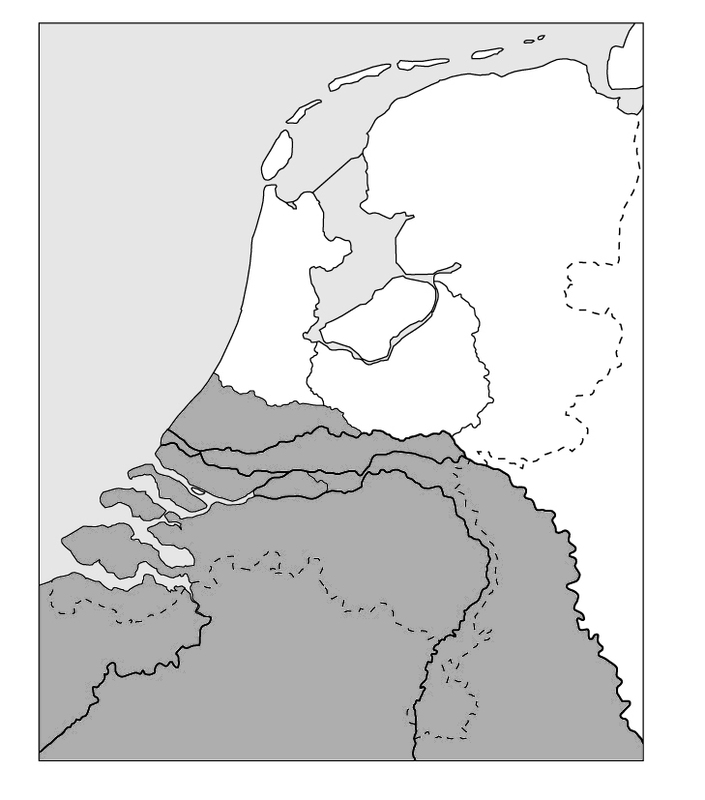 A Regional Study in the Dutch Eastern River Area. University of Amsterdam, Amsterdam (PhD-thesis). Zakšek, K., E. Fovet, L. Nuninger, and T. Pobodnikar (2008). Path Modelling and Settlement Pattern. In Posluschny, A., K. Lambers, and I. Herzog (eds. ), Layers of Perception. Proceedings of the 35th International Conference on Computer Applications and Quantitative Methods in Archaeology (CAA), Berlin, Germany, April 2–6, 2007 Dr. Rudolf Habelt GmbH, Bonn, pp. 309-315.